The Customer Service Teller assists the customers in completing their transactions and ensures that the customers’ needs are satisfied while also safeguarding the Company’s interest. The Customer Service Teller discharges various other job responsibilities such as preventing fraudulent transactions, promoting company products, submitting paperwork, assisting customers on the drive up window or directly, maintaining access to high-security areas, coordinating with company team on regular basis, explaining and solving problems of customers and providing appropriate referrals. A Skilled Customer Service Teller excels in customer service and Sales; possess terrific listening and communicative skills and builds a strong relationship with customers. They also show extraordinary skills in using computers, adding machines, calculators, printers, copiers, fax machine and computers. Some best skills sets that broaden the resume contain experience in using system or banking software. 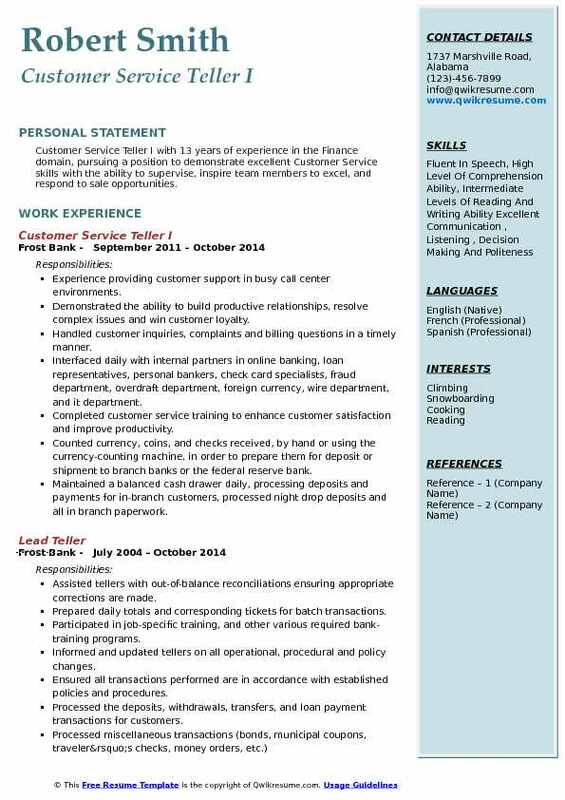 Customer Service Teller Resume shows a high school diploma or GED as a minimum requirement for becoming a Customer Service Teller. 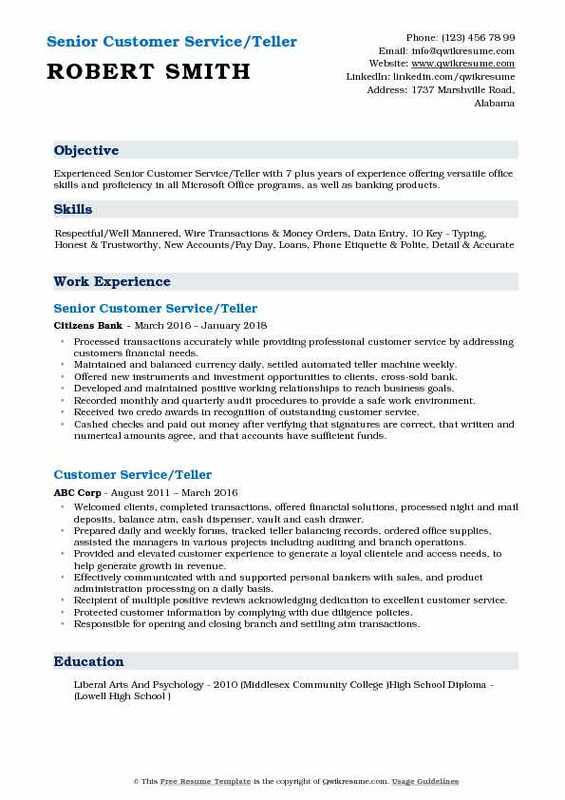 Summary : Customer Service/Teller III with 18 plus years of experience assisting the customers with all their needs and questions. Balances and maintains tellers drawers and other areas involving money. Keeping close records of all activities provided. Answered multiple phone lines and resolved questions or issues for the customer. Balanced currency, coin, and checks in cash drawers at ends of shifts, and calculate daily transactions using computers, calculators, or adding machines. Carried out special services for customers, such as ordering bank cards and checks. Composed, typed, and mailed customer statements and other correspondence related to issues such as discrepancies and outstanding unpaid items. Counted currency, coins, and checks received, by hand or using the currency-counting machine, to prepare them for deposit or shipment to branch banks or the federal reserve bank. Entered customers transactions into computers to record transactions and issue computer-generated receipts. 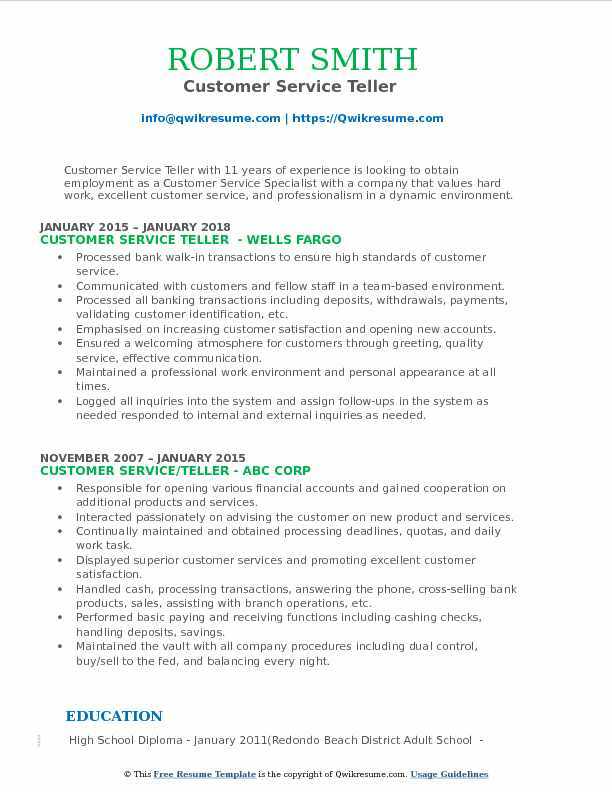 Objective : Junior Customer Service & Teller with 2 years of experience in the Finance domain. 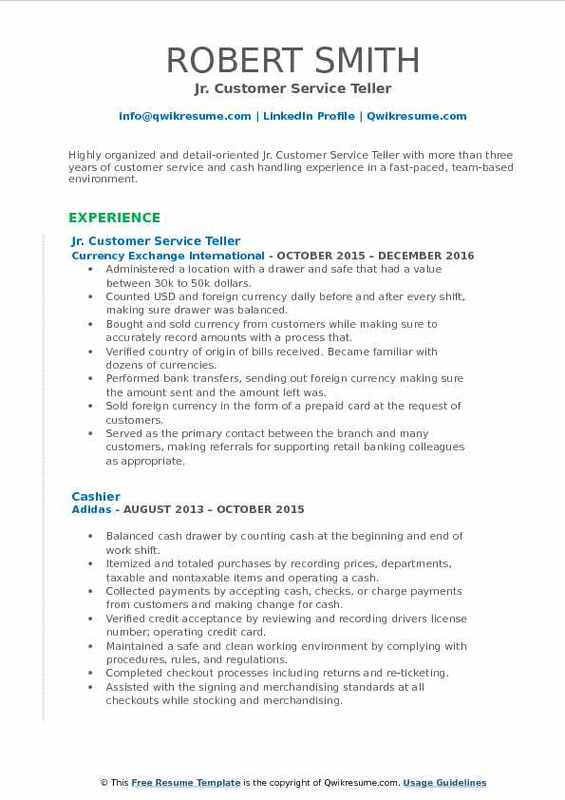 Highly motivated and always willing to learn more, seeking a Cashier position with excellent Customer Service and cash handling skills, will be fully utilized to provide a perfect buying experience to the customers. Bilingual in English and Spanish. Greeted clients, answering questions, upselling services, wire transactions, money orders, payday loans, start new accounts/loans, bus passes, tokens, postal stamps, faxing/photocopying, check cashing and utility and cable bill payments. Addressed the customers by name with a smile and direct eye contact. Maintained confidentiality when handling customer requests and transactions. Made small talk with customers whilst they are being served. Answered phones, customers questions, explained services and store location/hours. Accepted cash from customers, accepted payments from customers and gave change and receipts. Accurately received, counted and distributed the cash. Balanced out cash register at the end of the shift. Served cash and credit card payments. Manage all cash and data entry to computers. Supported the bank sales team by identifying customer needs and then promoting current offers to them. Followed the bank procedures when performing transactions. Reporting any suspicious customer activity to bank managers. 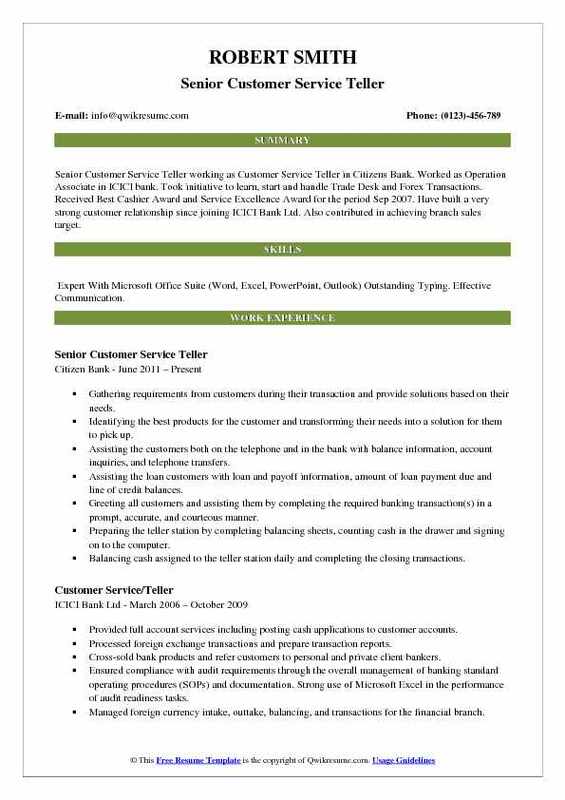 Summary : Senior Customer Service Teller working as Customer Service Teller in Citizens Bank. Worked as Operation Associate in ICICI bank. Took initiative to learn, start and handle Trade Desk and Forex Transactions. Received Best Cashier Award and Service Excellence Award for the period Sep 2007. Have built a very strong customer relationship since joining ICICI Bank Ltd. Also contributed in achieving branch sales target. Skills : Expert With Microsoft Office Suite (Word, Excel, PowerPoint, Outlook) Outstanding Typing. Effective Communication. Gathering requirements from customers during their transaction and provide solutions based on their needs. Identifying the best products for the customer and transforming their needs into a solution for them to pick up. Assisting the customers both on the telephone and in the bank with balance information, account inquiries, and telephone transfers. Assisting the loan customers with loan and payoff information, amount of loan payment due and line of credit balances. Greeting all customers and assisting them by completing the required banking transaction(s) in a prompt, accurate, and courteous manner. Preparing the teller station by completing balancing sheets, counting cash in the drawer and signing on to the computer. Balancing cash assigned to the teller station daily and completing the closing transactions. Objective : Highly organized and detail-oriented Jr. Customer Service Teller with more than three years of customer service and cash handling experience in a fast-paced, team-based environment. Administered a location with a drawer and safe that had a value between 30k to 50k dollars. Counted USD and foreign currency daily before and after every shift, making sure drawer was balanced. Bought and sold currency from customers while making sure to accurately record amounts with a process that. Verified country of origin of bills received. Became familiar with dozens of currencies. Performed bank transfers, sending out foreign currency making sure the amount sent and the amount left was. Sold foreign currency in the form of a prepaid card at the request of customers. Served as the primary contact between the branch and many customers, making referrals for supporting retail banking colleagues as appropriate. Resolved customer difficulties and assist customers to understand their banking options based on their personal preference for doing business with the bank. 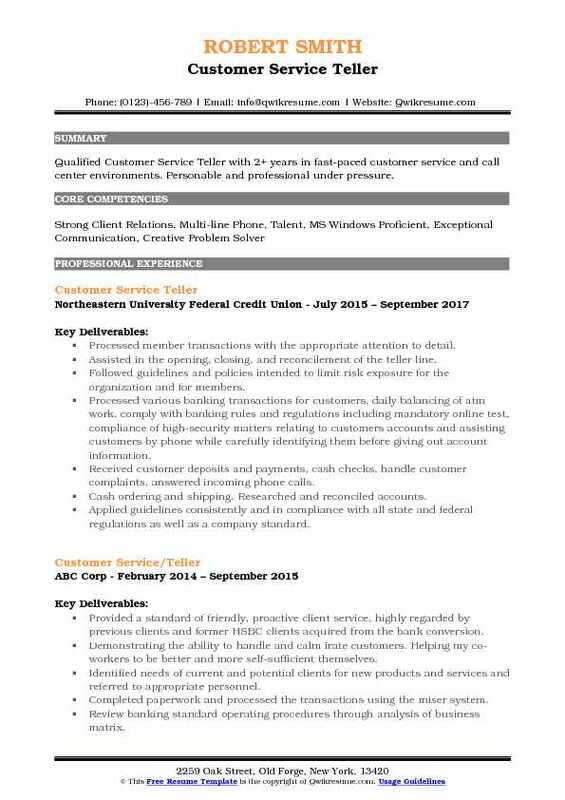 Summary : Customer Service Teller I with 13 years of experience in the Finance domain, pursuing a position to demonstrate excellent Customer Service skills with the ability to supervise, inspire team members to excel, and respond to sale opportunities. Experience providing customer support in busy call center environments. Demonstrated the ability to build productive relationships, resolve complex issues and win customer loyalty. Handled customer inquiries, complaints and billing questions in a timely manner. Interfaced daily with internal partners in online banking, loan representatives, personal bankers, check card specialists, fraud department, overdraft department, foreign currency, wire department, and it department. Completed customer service training to enhance customer satisfaction and improve productivity. Counted currency, coins, and checks received, by hand or using the currency-counting machine, in order to prepare them for deposit or shipment to branch banks or the federal reserve bank. Maintained a balanced cash drawer daily, processing deposits and payments for in-branch customers, processed night drop deposits and all in branch paperwork. 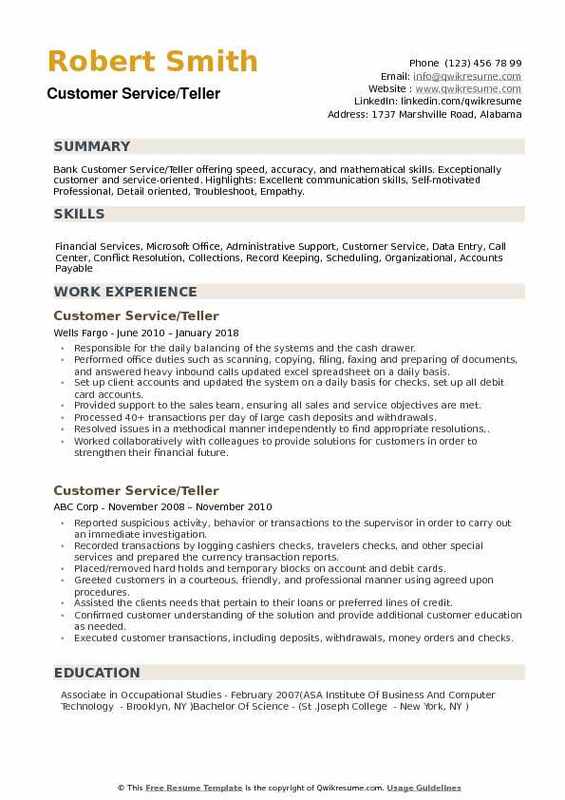 Summary : Experienced Senior Customer Service/Teller with 7 plus years of experience offering versatile office skills and proficiency in all Microsoft Office programs, as well as banking products. Processed transactions accurately while providing professional customer service by addressing customers financial needs. Maintained and balanced currency daily, settled automated teller machine weekly. Offered new instruments and investment opportunities to clients, cross-sold bank. Developed and maintained positive working relationships to reach business goals. Recorded monthly and quarterly audit procedures to provide a safe work environment. Received two credo awards in recognition of outstanding customer service. Received checks and cash for deposit, verify amounts and check the accuracy of deposit slips. Scored in the top 10% of all employees in the Southeast region in successfully achieving sales goal. 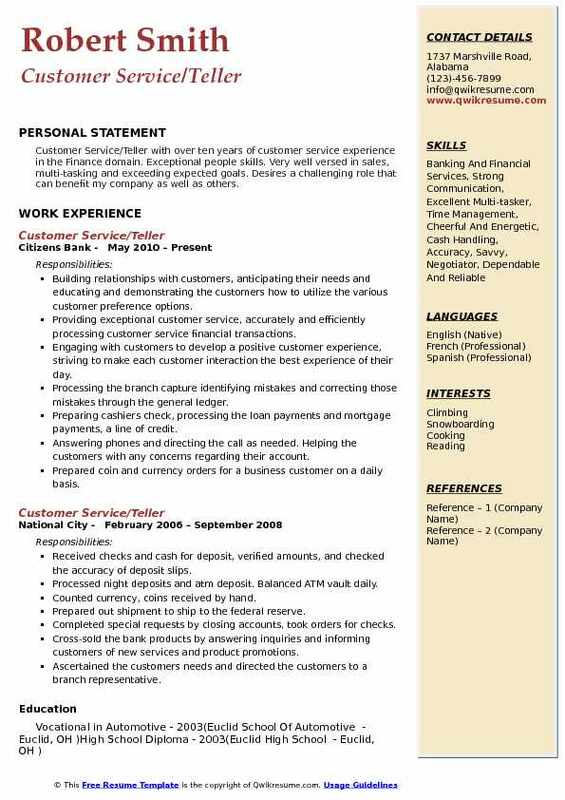 Summary : Customer Service Teller with 11 years of experience is looking to obtain employment as a Customer Service Specialist with a company that values hard work, excellent customer service, and professionalism in a dynamic environment. Processed bank walk-in transactions to ensure high standards of customer service. Communicated with customers and fellow staff in a team-based environment. Processed all banking transactions including deposits, withdrawals, payments, validating customer identification, etc. Emphasised on increasing customer satisfaction and opening new accounts. Ensured a welcoming atmosphere for customers through greeting, quality service, effective communication. Maintained a professional work environment and personal appearance at all times. Logged all inquiries into the system and assign follow-ups in the system as needed responded to internal and external inquiries as needed. Described products to customers and accurately explained details of dental insurance plans. Objective : Qualified Customer Service Teller with 2+ years in fast-paced customer service and call center environments. Personable and professional under pressure. Processed member transactions with the appropriate attention to detail. Assisted in the opening, closing, and reconcilement of the teller line. Followed guidelines and policies intended to limit risk exposure for the organization and for members. Processed various banking transactions for customers, daily balancing of atm work, comply with banking rules and regulations including mandatory online test, compliance of high-security matters relating to customers accounts and assisting customers by phone while carefully identifying them before giving out account information. Received customer deposits and payments, cash checks, handle customer complaints, answered incoming phone calls. Cash ordering and shipping. Researched and reconciled accounts. Applied guidelines consistently and in compliance with all state and federal regulations as well as a company standard. 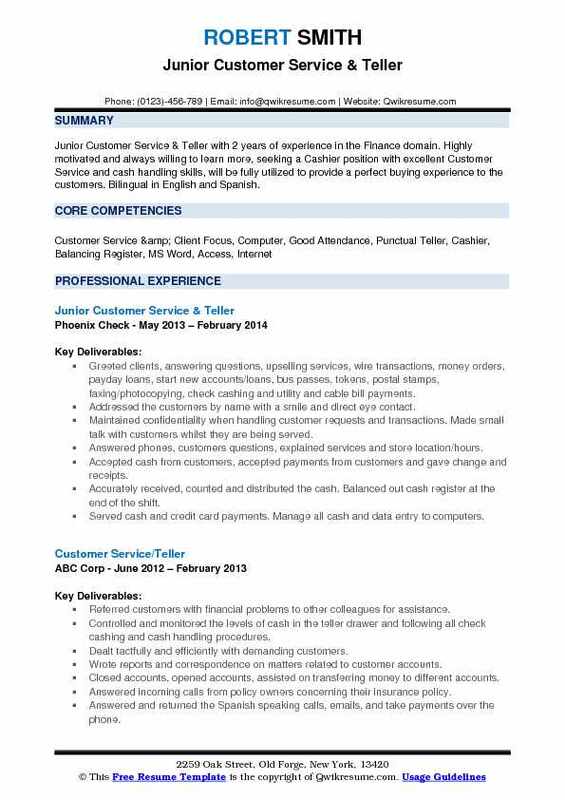 Summary : Customer Service/Teller with over ten years of customer service experience in the Finance domain. Exceptional people skills. Very well versed in sales, multi-tasking and exceeding expected goals. Desires a challenging role that can benefit my company as well as others. Building relationships with customers, anticipating their needs and educating and demonstrating the customers how to utilize the various customer preference options. Providing exceptional customer service, accurately and efficiently processing customer service financial transactions. Engaging with customers to develop a positive customer experience, striving to make each customer interaction the best experience of their day. Processing the branch capture identifying mistakes and correcting those mistakes through the general ledger. Preparing cashiers check, processing the loan payments and mortgage payments, a line of credit. Answering phones and directing the call as needed. Helping the customers with any concerns regarding their account. Prepared coin and currency orders for a business customer on a daily basis. Cashed checks and paid out money after verifying that signatures are correct, that written and numerical amounts are correct, and that accounts have sufficient funds. 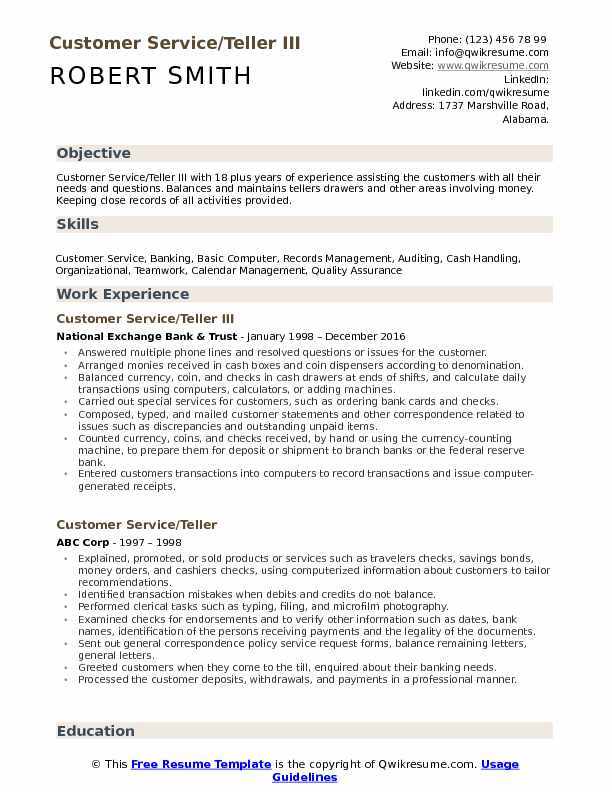 Summary : Bank Customer Service/Teller offering speed, accuracy, and mathematical skills. Exceptionally customer and service-oriented. Highlights: Excellent communication skills, Self-motivated Professional, Detail oriented, Troubleshoot, Empathy. Responsible for the daily balancing of the systems and the cash drawer. Performed office duties such as scanning, copying, filing, faxing and preparing of documents, and answered heavy inbound calls updated excel spreadsheet on a daily basis. Set up client accounts and updated the system on a daily basis for checks, set up all debit card accounts. Provided support to the sales team, ensuring all sales and service objectives are met. Processed 40+ transactions per day of large cash deposits and withdrawals. Resolved issues in a methodical manner independently to find appropriate resolutions,. Worked collaboratively with colleagues to provide solutions for customers in order to strengthen their financial future. Provided assistance with money transfer services, bill payments, and money orders. Identified each customer with the appropriate form of id depending on the amount of money sent or received in order to prevent money laundering, and scams.